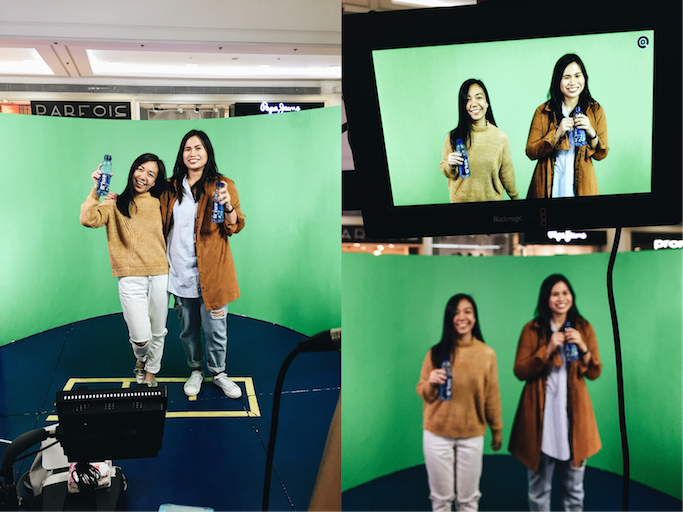 What do you do when you're with one of your crazy close friends, have some time to spare, and encountered a free booth where you can "create your own commercial"? Participate in the kagulo, of course! True enough, it's like a commercial set, complete with cameras, press people, and ANYONE can be the star (for around 10-15 minutes, actually). And since I was in the mood to try something crazy for the first time, we went for it! Yolo nalang! I got the B'lue Calamansi! Also available in Orange and Lychee. I cannot imagine doing this alone! Hahaha! Thank God I have Tracy with me! And of course, showed everyone the way to a more refreshing and confident life! Got interviewed, complete with "groupies" (haha!). Tracy promoted her new film with Papa P, hehehe. "Third party po ako ng Jadine." Awow. It was surprisingly fun! What did I get from all these? That life is all about going out of the box, taking risks (even when it's embarrassing! Haha! ), and just "laugh" and not take things too seriously! Thank you B'lue for this different experience! Made me feel alive from all the adrenaline rush, hehehe. Catch the next B'lue happenings by following them on Facebook, Twitter and Instagram @livetofeel_blue #FullyAliveWithBlue.